Michael J. Bojdys joined the Charles University in Prague (Czech Republic) in 2014 as an Assistant Professor. His current research interest lies in the field of functional nanomaterials for semiconductor applications, gas storage and catalysis. Previously, Michael was holder of a research fellowship of the German Academic Exchange Service (DAAD) at the Technische Universität Berlin (Germany). He worked as a postdoctoral researcher at the University of Liverpool (UK) from 2010 to 2013. He completed his PhD thesis between 2006 and 2009 "On new allotropes and nanostructures of carbon nitrides" at the Max Planck Institute of Colloids and Interfaces in Potsdam (Germany). In 2006 he graduated as Master of Natural Sciences at the University of Cambridge (UK). Crystalline and amorphous organic materials are an emergent class of heterogeneous photocatalysts for the generation of hydrogen from water, but a direct correlation between their structures and the resulting properties has not been achieved so far. To make a meaningful comparison between structurally different, yet chemically similar porous polymers, we present two porous polymorphs of a triazine-based graphdiyene (TzG) framework from a simple, one-pot reaction using Cu(I) for TzGCu and Pd(II)/Cu(I) for TzGPd/Cu catalyzed homocoupling polymerization. The polymers form via irreversible coupling reactions and give rise to a crystalline (TzGCu) and an amorphous (TzGPd/Cu) polymorph. Notably, the crystalline and amorphous polymorphs are narrow-gap semiconductors with permanent surface areas of 660 m2 g-1 and 392 m2 g-1, respectively. Hence, both polymers are ideal heterogeneous photocatalysts for water splitting with some of the highest hydrogen evolution rates reported thus far up to 972 μmol h-1 g-1 with and 276 μmol h-1 g-1 without Pt co-catalyst. We conclude, that crystalline order improves delocalisation, while the amorphous polymorph requires a co-catalyst for efficient charge transfer; this will need to be considered in future rational design of polymer catalysts and organic electronics. Water splitting using polymer photocatalysts is a key technology to a truly sustainable hydrogen-based energy economy. Synthetic chemists have intuitively tried to enhance photocatalytic activity by tuning the length of π-conjugated domains of their semiconducting polymers, but the increasing flexibility and hydrophobicity of ever-larger organic building blocks leads to adverse effects such as structural collapse and inaccessible catalytic sites. To reach the ideal optical bandgap of ~2.3 eV, we synthesised a library of eight sulphur and nitrogen containing porous polymers (SNPs) with similar geometries but with optical bandgaps ranging from 2.07 to 2.60 eV using Stille coupling. 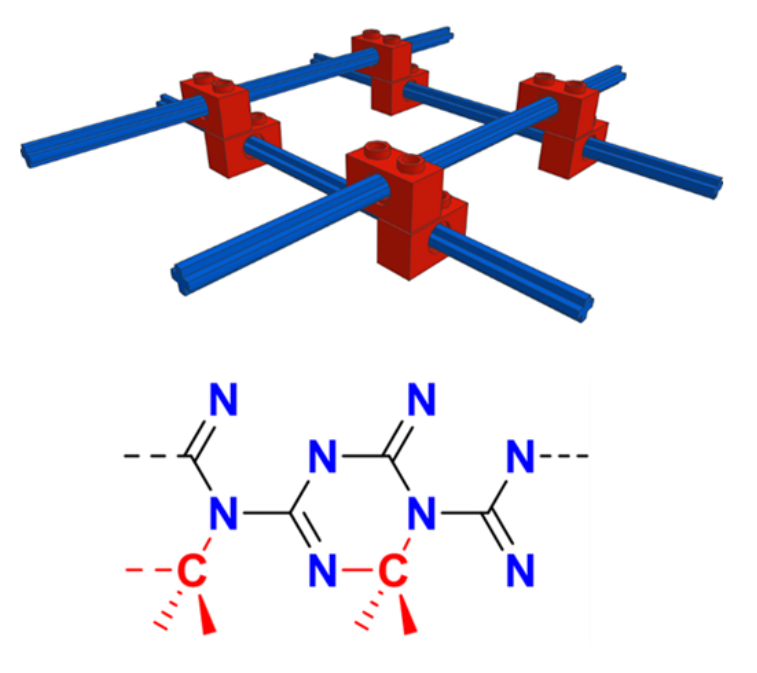 These polymers combine π-conjugated electron-withdrawing triazine- (C3N3) and electron donating, sulphur-containing moieties as covalently-bonded donor-acceptor frameworks with permanent porosity. The remarkable optical properties of SNPs enable fluorescence on-off sensing of volatile organic compounds and illustrate intrinsic charge-transfer effects. Moreover, obtained polymers effectively evolve H2 gas from water under visible light irradiation with hydrogen evolution rates up to 3158 µmol h-1 g-1 and high apparent quantum efficiency which is the highest value obtained for microporous organic polymers to-date. 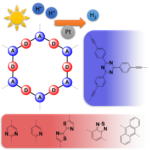 The design principles demonstrated here are transferable to a new field of high-performance polymer photocatalysts based on efficient donor-acceptor dyads. 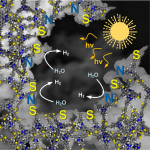 Light-driven water splitting is a potential source of abundant, clean energy, yet efficient charge-separation and size and position of the bandgap in heterogeneous photocatalysts are challenging to predict and design. 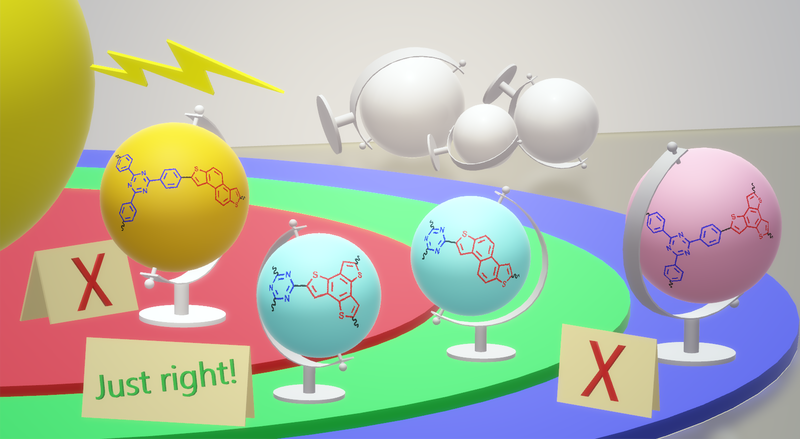 Synthetic attempts to tune the bandgap of polymer photocatalysts classically rely on variations of the sizes of their π-conjugated domains. However, only donor-acceptor dyads hold the key to prevent undesired electron-hole recombination within the catalyst via efficient charge separation. Building on our previous success in incorporating electron-donating, sulphur-containing linkers and electron-withdrawing, triazine (C3N3) units into porous polymers, we report the synthesis of six visible-light active, triazine-based polymers with a high heteroatom-content of S and N that photocatalytically generate H2 from water: up to 915 µmol h-1 g-1 with Pt co-catalyst, and – as one of the highest to-date reported values – 200 µmol h-1 g-1 without. The highly modular Sonogashira-Hagihara cross-coupling reaction we employ, enables a systematic study of mixed (S, N, C) and (N, C)-only polymer systems. Our results highlight that photocatalytic water-splitting does not only require an ideal optical bandgap of ~2.2 eV, but that the choice of donor-acceptor motifs profoundly impacts charge-transfer and catalytic activity. Design and synthesis of ordered, metal-free layered materials is intrinsically difficult due to the limitations of vapor deposition processes that are used in their making. Mixed-dimensional (2D/3D) metal-free van der Waals (vdW) heterostructures based on triazine (C3N3) linkers grow as large area, transparent yellow-orange membranes on copper surfaces from solution. The membranes have an indirect band gap (Eg,opt = 1.91 eV, Eg,elec = 1.84 eV) and are moderately porous (124 m2 g−1). The material consists of a crystalline 2D phase that is fully sp2 hybridized and provides structural stability, and an amorphous, porous phase with mixed sp2–sp hybridization. 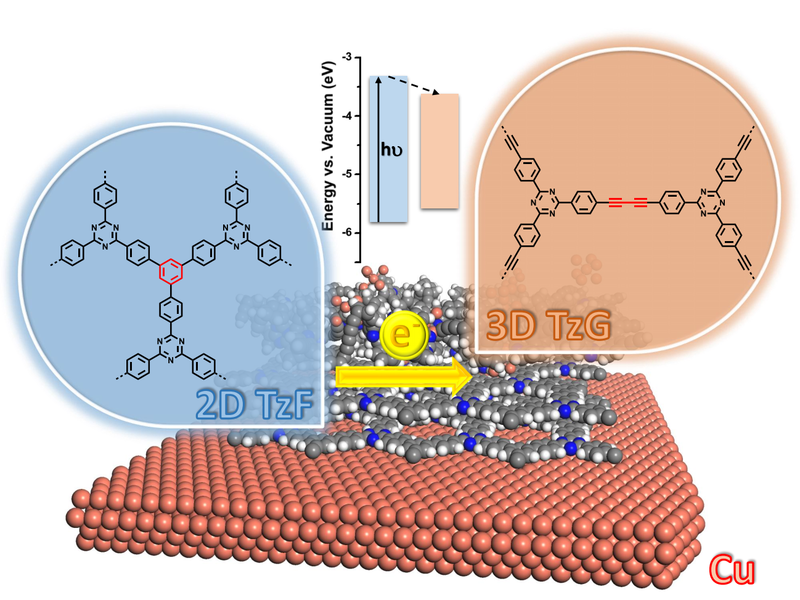 Interestingly, this 2D/3D vdW heterostructure grows in a twinned mechanism from a one-pot reaction mixture: unprecedented for metal-free frameworks and a direct consequence of on-catalyst synthesis. Thanks to the efficient type I heterojunction, electron transfer processes are fundamentally improved and hence, the material is capable of metal-free, light-induced hydrogen evolution from water without the need for a noble metal cocatalyst (34 µmol h−1 g−1 without Pt). The results highlight that twinned growth mechanisms are observed in the realm of “wet” chemistry, and that they can be used to fabricate otherwise challenging 2D/3D vdW heterostructures with composite properties. Donor-acceptor dyads hold the key to tuning of electrochemical properties and enhanced mobility of charge carriers, yet their incorporation into a heterogeneous polymer network proves difficulty due to the fundamentally different chemistry of the donor- and acceptor-subunits. We present a family of sulphur and nitrogen containing porous polymers (SNPs) that are obtained via Sonogashira-Hagihara cross-coupling and that combine electron-withdrawing triazine (C3N3) and electron donating, sulphur-containing linkers. 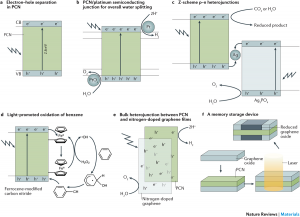 Choice of building blocks and synthetic conditions determines the optical band gap (from 1.67 to 2.58 eV) and nanoscale ordering of these microporous materials with BET surface areas of up to 545 m2 g-1 and CO2 capacities up to 1.56 mmol g-1. 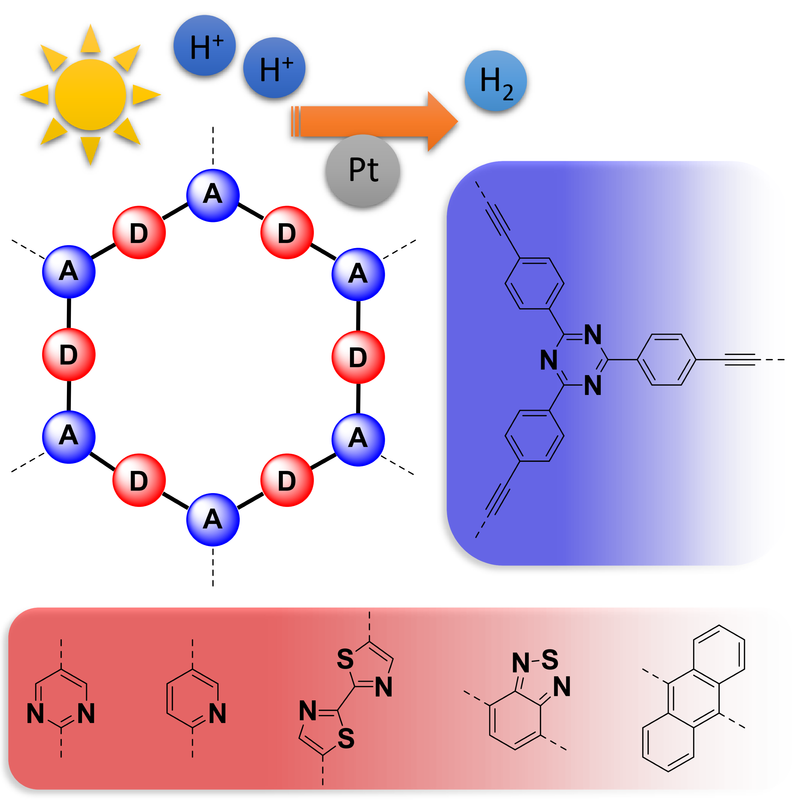 Our results highlight the advantages of the modular design of SNPs, and we report one of the highest photocatalytic hydrogen evolution rates for a cross-linked polymer without Pt co-catalyst (194 µmol h-1 g-1). In the past decade, research in the field of artificial photosynthesis has shifted from simple, inorganic semiconductors to more abundant, polymeric materials. For example, polymeric carbon nitrides have emerged as promising materials for metal-free semiconductors and metal-free photocatalysts. Polymeric carbon nitride (melon) and related carbon nitride materials are desirable alternatives to industrially used catalysts because they are easily synthesized from abundant and inexpensive starting materials. Furthermore, these materials are chemically benign because they do not contain heavy metal ions, thereby facilitating handling and disposal. 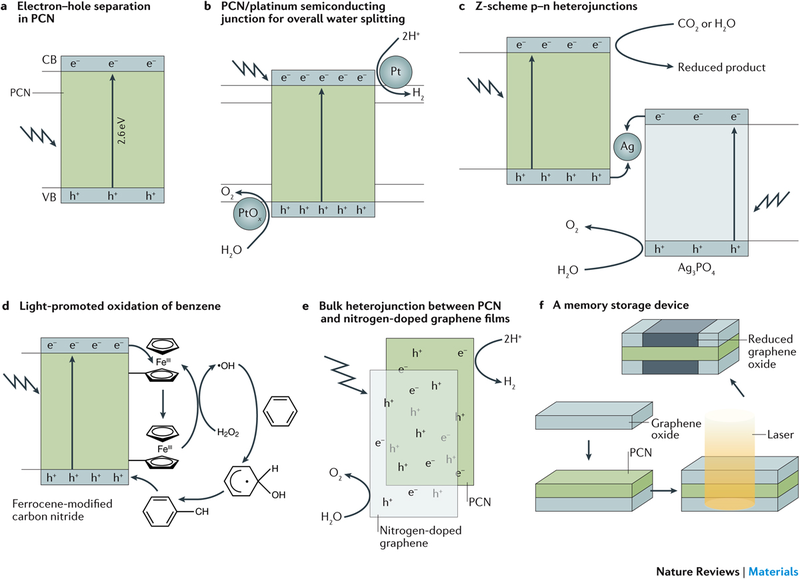 In this Review, we discuss the building blocks of carbon nitride materials and examine how strategies in synthesis, templating and post-processing translate from the molecular level to macroscopic properties, such as optical and electronic bandgap. Applications of carbon nitride materials in bulk heterojunctions, laser-patterned memory devices and energy storage devices indicate that photocatalytic overall water splitting on an industrial scale may be realized in the near future and reveal a new avenue of ‘post-silicon electronics’. Crystalline frameworks composed of hexacoordinated silicon species have thus far only been observed in a few high pressure silicate phases. By implementing reversible Si–O chemistry for the crystallization of covalent organic frameworks, we demonstrate the simple one-pot synthesis of silicate organic frameworks based on octahedral dianionic SiO6 building units. Clear evidence of the hexacoordinated environment around the silicon atoms is given by 29Si nuclear magnetic resonance analysis. Characterization by high-resolution powder X-ray diffraction, density functional theory calculation and analysis of the pair-distribution function showed that those anionic frameworks—M2[Si(C16H10O4)1.5], where M = Li, Na, K and C16H10O4 is 9,10-dimethyl-2,3,6,7-tetraolatoanthracene—crystallize as two-dimensional hexagonal layers stabilized in a fully eclipsed stacking arrangement with pronounced disorder in the stacking direction. Permanent microporosity with a two-step filling process was evidenced by gas-sorption measurements. The negatively charged backbone balanced with extra-framework cations and the permanent microporosity are characteristics that are shared with zeolites. Glöcklhofer, F.; Petritz, A.; Karner, E.; Bojdys, M. J.; Stadlober, B.; Fröhlich, J.; Unterlass, M. M. Journal of Materials Chemistry C 2017, Advance Article, DOI: 10.1039/C7TC00143F. 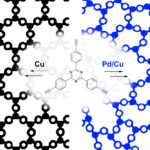 Cyanated pentacenes are very promising candidate materials for ambipolar and n-type transistors. However, only a few examples have been obtained to date – all requiring lengthy, multi-step processes. Herein, we present the first preparation of 5,7,12,14-tetracyanopentacene (TCP) and a facile, scaled-up preparation of 6,13-dicyanopentacene (DCP). Both compounds are prepared by a one-pot synthesis using cheap quinones as starting materials. 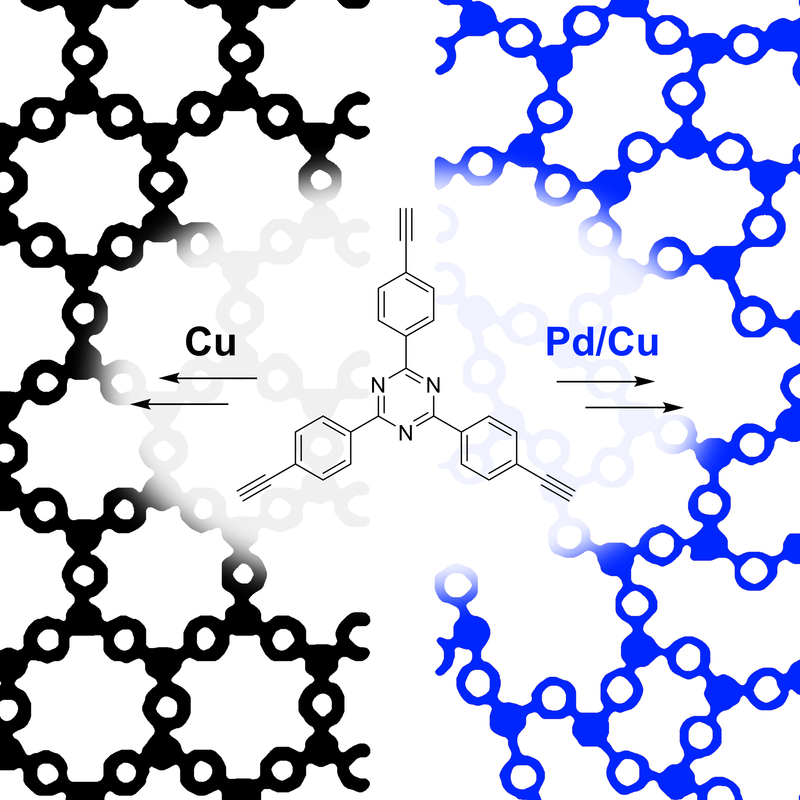 Detailed crystallographic investigations evince that the bulk assemblies of both cyanated pentacenes are dominated by non-covalent interactions, resulting in a dense, stable, face-to-face packing and in an intriguing packing motif for TCP. Very low frontier molecular orbital energy levels and a reversible bleaching of TCP are revealed by cyclic voltammetry. Finally, both cyanated pentacenes are used in proof-of-concept organic thin-film transistors (OTFTs) operating under ambient conditions. This work highlights the potential of cyanation for larger acenes and presents a straightforward route to the rational design of this promising class of materials. 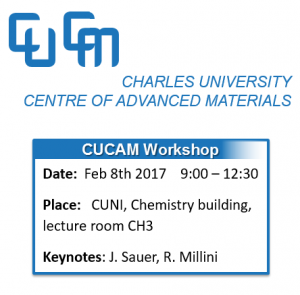 Want to find out more about the new “Charles University Center of Advanced Materials” (CUCAM)? Come along on the 8th of February to our kick-off workshop at Charles University, Department of Chemistry, Hlavova 8 in Prague! Pickard, C. J.; Salamat, A.; Bojdys, M. J.; Needs, R. J.; McMillan, P. F. Physical Review B 2016, 94, 094104, DOI: 10.1103/PhysRevB.94.094104, arXiv:1605.02893. We used ab initio random structure searching (AIRSS) to investigate polymorphism in C3N4 carbon nitride as a function of pressure. Our calculations reveal new framework structures, including a particularly stable chiral polymorph of space group P43212 containing mixed sp2 and sp3-bonding, that we have produced experimentally and recovered to ambient conditions. As pressure is increased a sequence of structures with fully sp3-bonded C atoms and three-fold coordinated N atoms is predicted, culminating in a dense Pnma phase above 250 GPa. Beyond 650 GPa we find that C3N4 becomes unstable to decomposition into diamond and pyrite-structured CN2.